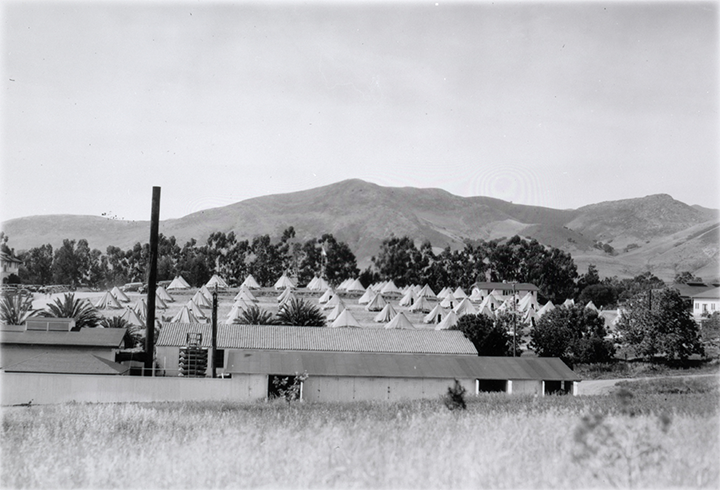 Beginning in the 1930s, Cal Poly students and staff welcomed FFA members from high schools across California for the annual State Convention, which was held at Cal Poly starting in the 1931-1932 school year, the same year Cal Poly established a local chapter of the FFA. Each May, approximately 800 high school FFA members from across the state came to Cal Poly for three days to attend the convention. The three days were fi lled with meetings, instructional sessions, tours of the campus buildings and farm units, and a “full program of entertainment” that included swimming, a banquet, music, boxing and wrestling, and a dance. Attendance for the convention doubled the number of students on campus — at the time Cal Poly enrolled between 400-600 students. To accommodate the attendees, the campus installed a temporary “tent city” of 100 army tents in the center of campus (near where the Dexter Lawn is today), which could house up to 800 visitors. Today, Cal Poly continues the tradition by welcoming more than 2,000 students from across the state at the annual California State FFA Finals competition in May. Students compete in 21 events in categories including agronomy, dairy cattle, farm business management, fl oriculture, forestry, livestock, nursery landscape, marketing, vegetable crops, vet science and welding. A group of volunteers including Cal Poly faculty, staff and students, industry professionals, and community members judge the events. Visit the Cultivate Summer 2018 Page to read more stories.